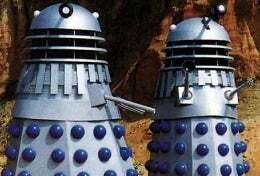 The sturdiness of the British legal system and strength of the BBC were both demonstrated recently with the resolution of a lawsuit that claimed that the BBC had breached copyright with the publication of a Doctor Who tie-in book that included mention of everyone's favorite overused villains, the Daleks because their dad had published some Dalek books thirty years ago. Or something. The case was brought by small publishers JHP, who had published books based upon the Who characters in the 1960s because of then-chairman Jack Fishman's friendship with Dalek creator Terry Nation. Current boss Paul Fishman, Jack's son, felt that, because the BBC's 2007 book The Dalek Survival Guide had covered similar ground to their earlier books, then their copyright had been violated. Even though they didn't own the copyright to the material in those books. Mr Justice Norris decided there had not been substantial copying and it was "inherently improbable" that Mr. Nation would have assigned his copyright to the publishing company. Not impossible, not something that could be, you know, legally binding or anything, just "improbable." You have to love the way that British law works.